TORONTO—In early February a horrific accident shocked Ontario. A flatbed truck struck a passenger van at a rural intersection near Stratford, two hours west of Toronto, killing 11 people. Of the deceased, only one was a Canadian citizen; the others were agricultural migrant workers from Peru who were being transferred from one job to the next in the passenger van. It is sadly indicative that one of Ontario’s worst traffic accidents in history should involve migrant workers, since the latter already experience some of the worst working and living conditions in the province. They usually work long hours for low pay, on dangerous and very physically demanding jobs that few Canadians would consider doing. They live separated from their families for long stretches of time, in isolation from the wider community, and sometimes in cramped, substandard living quarters. Little is done to challenge or change these conditions because migrant workers are often afraid to speak out. “They’re more vulnerable. They don’t have access to the same kinds of services as permanent migrants … they have a fear of loss of employment, which means they’re less likely to report unsafe working conditions,” according to a Laurier University researcher on migrant workers, Jenna Hennebry, quoted in the Globe and Mail. What was Ottawa’s response? Expand the migrant worker program. In 2007, there were over 300,000 foreign temporary workers in Canada, according to Laurier’s International Migration Research Centre, up from 80,000 a decade earlier. Under Conservative Prime Minister Stephen Harper, the growth in migrant workers has outstripped that of immigrants—a clear sign of his government’s priorities. In a country built by immigrants, it should not be acceptable that some who continue that work today be denied proper working conditions and the benefit of making a home here. Obstacles in the path of unionization of agricultural workers must be removed. Socialists also demand that migrant worker programs be quickly phased out of existence, and that all migrant workers who have lived and worked for the required period of time in Canada be offered citizenship. Because, as we know, “an injury to one is an injury to all,” this issue should be a priority for unions and the labour-based New Democratic Party. 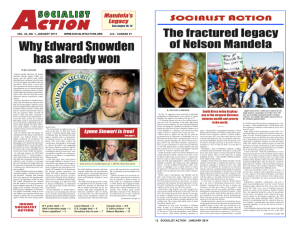 > The article above was written by Ric Ekapuk, and first appeared in the March 2012 print edition of Socialist Action newspaper. March 7, 2012 in Canada, Labor.